Shame on the Mets for their cowardly firing of coach Willie Randolph. Yes, the Mets are underachieving and yes, someone needs to be held accountable, but to fire Randolph in an email quietly at 3:00 AM? It is a cowardly move and speaks volumes about what a disorganized mess the Mets are. Maybe Randolph isn't the best coach in baseball, and maybe he had lost control of the Mets, that highly paid, looks-so-good-on-paper juggernaut that collapsed at the end of the '07 season and struggled to a meager 34-35 start this season. But did he deserve to be fired after a win? While the team is stuck on the West Coast? By email? Let me also take this opportunity to chortle, probably for the 1,531st time this season, over the Mets struggles. Click here for all of the comments from Mets fans calling me an idiot for not awarding the N.L East to the Mets at the start of the season. I'm amazed that they can spell. -Nice to see the Phillies bats come alive in last night's 8-2 crushing of the Boston Red Sox. Don't get too confident, Phillies fans, about tonight's game. The Phillies won Game One of the 1915 World Series, then didn't win another playoff game until 1977. I'm a life long Phillies fan and I'm having a blast watching them play this year. Could the Mets organization have stooped any lower? PS; Hey Mets fans with your fancy vocabularies, where are your comments now? Another post with you bashing the Mets, and calling for your own greatness.. How original. Have some class. Take a look at other Phillies blogs, she how they handle things. Seeing how they get near 100 comments, and you struggle to get a handful you should take some notes. "calling for your own greatness"
I'll leave aside the grammatical issues and ask you to point out where I celebrated my own greatness? haha this is great...sorry muts! First off, you are OBSESSED with the Mets. No matter what the topic is, you manage to toss a Met reference in. Well, that is except for when the Mets won the two series played against the Phillies this year that is. Let it go. Is this a Phillies blog or a Mets one? Jeez. Second, The Mets did NOT fire Willie at 3 am by email. Jeez... get your story straight. It was a 11:15 PM (right after Willie got back to the hotel from the game). The PRESS RELEASE emailed to the New York Media was at 3 am. And yes, the move WAS fairly class-less. He should have been let go after the sweep at the hands of the Padres the weekend before. The Mets organization handled it badly. They look stupid. I agree with that. 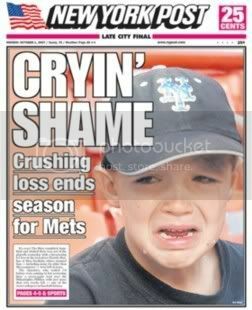 Third... after ALL of the Mets problems... they are only five games back in the loss column. There are a LOT of head to head games left. If the Mets take 5 out of the next six head to head games from Philly the lead is all but gone, so I'd lighten up on the glee. The Phillies have played VERY well this year. The Offense has been fantastic and the come from behind ability has been a huge plus. The bullpen has been excellent. However, the names IN that bullpen have a tenditicy to lose it so a full season of excellence is not a sure thing. Also the starting pitching has been fairly weak for the most part and things don't look to get any better. The season is a marathon, not a sprint. Just like you Philly fans kept saying last year... we'll see who's standing at the end. My opinion? Both teams make the playoffs actually. I think the Rocket guy mixed up his time zones. They either fired Randolph at 1:15 ET or sent the email at midnight PT depending on what time zone you're talking about. They didn't fire Randolph during the game. Maybe the Mets will win all those games they have in hand, just like they did with the one that they clinged to last September when the Cards went to Shea for a one game series. Still, reading those preseason gloats from NY is amusing, even if they do end up making the playoffs. No, I did not mix up my time zones. Willie was fired at approx 11:15 PM pacific time in Califonia (2:15 am eastern time) at the hotel when he arrived there AFTER the game. Then roughly around 12 midnight pacific time in CA (3 am eastern time) a Press Release annoucing the firing and telling of a 5 PM press conference for the next day was sent via email to media outlets. I don't even know where you got the 1:15 time you state. Reread my first post. I said 11:15. I also said it was at the hotel AFTER the game. I said nothing about 1:15 OR that it was at the game. The game ended about 10 PM pacific time. Willie got to the hotel about 11 PM pacific time. He was then called directly to Omar's hotel room for a meeting the resulted in his dismissial. In any case, Mike's claim that Willie was fired at 3 am by email is wrong on BOTH the time and way it was done counts. The fact the Mets did it on Monday and had Willie fly 3,000 miles to be fired was stupid and unfair to him. Doing it after a WIN and after winning 3 out of 4 was also stupid. The REST of it was warranted however. Willie needed to go. The team was NOT responding under his watch. Not for a long time now. There are 91 games left in the Mets season. There are 88 games left in the Phillies season. Let's say the Phillies play eight games over .500 for the rest of the season (going 48 - 40). That would give them a 90-72 record for the year (I think that is fair). The Mets would have to go 55-36 for the rest of the season. (19 games over .500) to tie them. That is a tall order. Can it be done? Most certainly. Will it be? I think it's quite an uphill battle and will mainly come down to the head to head games... of which the two teams have 12 games left with each other. If the Phillie dominate those games.. well, the Mets changes of coming back and winning the NL East are slim to none. If the Mets dominate those games, the odds are MUCH improved. In the end I think the Mets are more likely to be able to win roughly 88 to 89 games and win the wild card, of which teams like Florida and St Louis are not going to be around enough all year to be a huge roadblock for them. As for a lot of the things Mets fans said before the season started... listen.. even AS a Met fan I know a chunk of the average Met fans are stupid (as are a LARGE chunk of Phllies fans, Yankee fans and Boston fans). Downright gloating without facts or thoughts to back it up is a staple of the average, moronic fan. However, the endless gloating Mike is doing right now will be no better than their crap if the Phillies blow it this year. Best to be even-keeled about things. Theres a lot of baseball still to play. And if not... well... don't complain about the Met fans crap if your going to spout of stupid crap yourself. The firing may have been cowardly but you can't argue with the results. Mets have been on fire with Manuel as the mangager. I still think their age will come into play down the stretch and the Phils will end up taking the division, but ridding themseleves of Randolph seems to be the right move...just done the wrong way. Thanks for sharing your view..
Are you unaware of the process to deal with two-factor authentication functionalities in Blockchain account? How to handle 2fa errors is the major issue and do you have any solutions in your kitty? To remove the errors completely from the bottom, you should speak to the professional who knows all the tricks and methods to deal with the errors that are troubling you. Just dial Blockchain number 888-764-0492 and get unlimited solutions from one of the members of team in quick time.